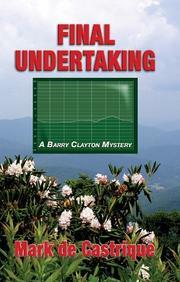 A sleuthing small-town North Carolina undertaker solves another many-layered mystery. The Friday Night Street Stomp, Gainesboro’s weekly public party with music, is brutally disrupted by a shooting. A seemingly irrational old man shouts, “Lincoln! . . . This is for Lucy,” then whips out a pistol and shoots at an unidentified middle-aged target. The presumed Lincoln pulls an unidentified young woman into the shooter’s path, and she takes a bullet, as does Cindy Todd, the daughter of local café-owner Helen. Sheriff Tommy Lee is able to shoot the assailant dead, but not before being seriously wounded himself. When he’s hospitalized, funeral director/narrator/sometime sleuth Barry Clayton (Foolish Undertaking, 2006, etc.) is pressed into service. Barry has moved from Charlotte to the quiet Appalachian town to tend to his Alzheimer’s-afflicted father, who provides one of several competing subplots. The main event, though, is clearly the bizarre shooting, which provides many questions: Who was Lincoln? Who was the shooter? Who was the girl? When she dies, the challenge of the case doubles. Barry finds himself temporarily returning to his roots as a Charlotte cop, dealing with young drug addicts and putting together an undercover operation. Readers may be hard-pressed to keep the tangle of narrative threads straight, but Barry is an amiable guide to untangling them, and a reliable source of many provocative tidbits about embalming.